Annuals; glabrous or pubescent. Stems erect, branched distally, (2-)4-12(-16) dm, sparsely to densely hirsute basally, glabrous or glabrate distally. Basal leaves rosulate; petiole 1-10(-15) cm; blade broadly oblanceolate, oblong, or lanceolate (in outline), (2-)5-20(-35) cm × (10-)20-80(-100) mm, margins pinnatisect, pinnatifid, or runcinate; lobes (3-)4-6(-8) on each side, oblong or lanceolate, smaller than terminal lobe, margins entire, dentate, or lobed. Cauline leaves similar to basal; distalmost blade with linear to filiform lobes. Fruiting pedicels usually divaricate, rarely ascending, stout, nearly as wide as fruit, (4-)6-10(-13) mm. Flowers: sepals ascending or spreading, oblong, (cucullate), 4-6 × 1-2 mm; petals spatulate, (5-)6-8(-10) × 2.5-4 mm, claw 3.5-6 mm; filaments 2-6 mm; anthers oblong, 1.5-2.2 mm. Fruits narrowly linear, usually straight, smooth, stout, (4.5-)6-9(-12) cm × 1-2 mm; valves glabrous; ovules 90-120 per ovary; style 0.5-2 mm; stigma prominently 2-lobed. Seeds 0.8-1 × 0.5-0.6 mm. 2n = 14. Flowering Apr-Sep. Roadsides, fields, pastures, waste grounds, disturbed sites, grasslands; 0-2700 m; introduced; Greenland; Alta., B.C., Man., N.B., Nfld. and Labr. (Nfld. ), N.W.T., N.S., Ont., P.E.I., Que., Sask., Yukon; Alaska, Ariz., Calif., Colo., Conn., D.C., Fla., Idaho, Ill., Ind., Iowa, Kans., Maine, Md., Mass., Mich., Minn., Mo., Mont., Nebr., Nev., N.H., N.J., N.Mex., N.Y., N.C., N.Dak., Ohio, Okla., Oreg., Pa., R.I., S.Dak., Tenn., Tex., Utah, Vt., Va., Wash., W.Va., Wis., Wyo. ; Europe; w Asia; nw Africa; introduced also in South America (Argentina, Chile). 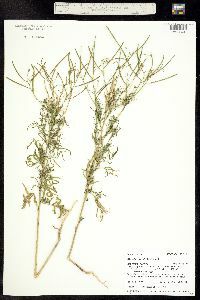 Annual herb with a large taproot to 1 m tall Stem: upright, usually branched near the apex, sometimes purplish at the nodes, hairy on the basal one-fourth, and with a waxy coating (glaucous) above. Flowers: in compact, branched clusters (racemes), which are borne terminally and laterally on the stems. Racemes about 15 cm long. Flower stalks 7 - 8 mm long. Sepals four, upright to spreading, green, 5 - 6 mm long, 1.3 mm wide, linear, tips rounded, involute (rolled inward along the margins above). Petals four, exserted, spreading in the apical half, pale yellow, to 1 cm long, 2 - 3 mm wide at apex, spoon-shaped, bases narrowed, tips rounded. Stamens six, upright. 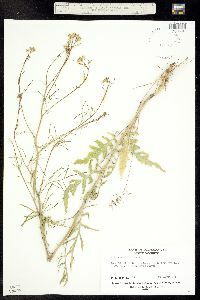 Fruit: a long, narrow pod (silique), ascending to upright, stalks thick (nearly as thick as pods), 5 - 10 cm long, 1 - 1.5 mm wide, angled, sickle-shaped, on stalks to 1 cm long. 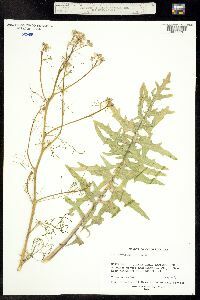 Lower leaves: alternate, pinnately divided, stalked (purplish at base), leaf axes sparsely hairy. Segments five to eight pairs, 1 - 1.5 cm long, about 5 mm wide, awl- to lance-shaped, tips pointed, sometimes coarsely toothed and often involute (rolled inward along the margins above), shortly hairy. Terminal segments wider than the laterals and involute. 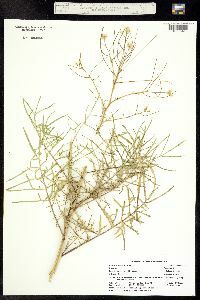 Upper leaves: alternate, pinnately divided, stalked, small, leaf axes sometimes sparsely short-hairy. Segments fewer than lower leaves, about 2.5 cm long, about 1 mm wide, linear, bases often with smaller divisions, pointed at the tip, involute (rolled inward along the margins above). Habitat and ecology: Introduced from Eurasia. Frequent on railroad ballast. It also grows in waste ground and recently disturbed sandy soils. Etymology: Sisymbrium is the Ancient Greek name for various plants. Altissimum means very tall; tallest. 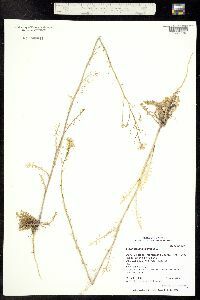 This is a weed generally of very sandy soil and is found most often in sandy ballast along railroads. 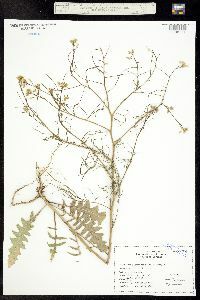 It is also found along roadsides and in waste places and fallow fields where it is sometimes abundant, especially in the sandy area of the northwestern part of the state, where it sometimes covers acres.